The General Details Tab in the Pages section of Evoke allows you to define the attributes and top level details of the selected page. Margin top (px) - used to specify the margin between the top edge of the screen and the boundary of the App for this Page. This field is initially populated by the information entered in the Theme and can be redefined here specifically for this page. Margin bottom (px) - used to specify the margin between the bottom edge of the screen and the boundary of the App for this Page. This field is initially populated by the information entered in the Theme and can be redefined here specifically for this page. Margin right (px) - used to specify the margin between the right side edge of the screen and the boundary of the App for this Page. This field is initially populated by the information entered in the Theme and can be redefined here specifically for this page. Margin left (px) - used to specify the margin between the left side edge of the screen and the boundary of the App for this Page. This field is initially populated by the information entered in the Theme and can be redefined here specifically for this page. Background Type - used to select if a specific background colour, image or watermark is to be used for this page. The options are:. Background Theme Colour - (shown if Theme Colour selected above) used to pick the background colour from the Theme Colour palate. Background Web Colour - (shown if Web Colour selected above) used to pick the web colour - either the Hex Colour Code or the CSS recognisable name e.g. Red. Background Image - (shown if background image selected above) used to pick the background image - use the "choose" option to select an image from the file explorer on your PC. 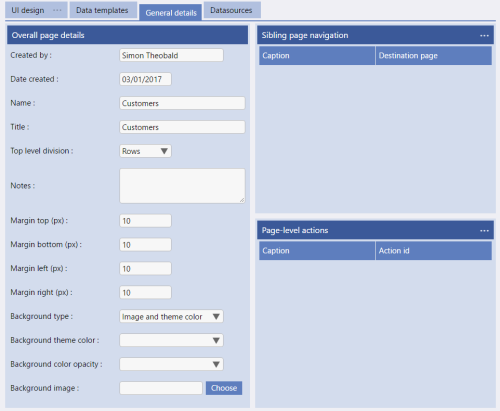 Sibling Page navigation is used to add an ellipsis menu at the page header level that provides page specific navigation options. Sibling Page Navigation allows the user of the app to move around, between various Pages at the same logical level within the app, without having to navigate back through multiple parent/child pages or main menu navigation. As many sibling page navigations as required may be added by selecting the "caption" that will appear e.g. "Amend Record" and selecting the page to navigate to if selected. Nudge up and down options allow the order of the captions in the ellipsis menu to be changed. If you wish for the user to be able to return to the original page/screen then a sibling navigation back to the original page also needs to be included. Page-level actions are used to set up an actions ellipsis in the page header. These are actions relate to page not individual segments and are generally actions that are implemented via custom code. Please be aware that the content of the ellipsis is combined with sibling page navigation so the names chosen must be different in sibling page navigation and page-level actions.